Today, I experienced something remarkable and unlike anything I’d ever experienced before. Kathy reached out to me via e-mail after having read about her friend Craig whom I was delighted to meet on day 36. She was intrigued by my blog and has since read every single post. “Every post?”, I asked her in disbelief, almost spitting out my tea on the muffins and cookies she’d so neatly laid out. Every post. She said that my writing style reminds her of Maeve Binchy — an author of whom she’s fond. Kathy enjoys following along for the journey through the days. I am astounded beyond comprehension. A stranger has been, in a sense, meeting all of these strangers with me. We even spoke together about the different people I had met, as though they were characters in a story, each reflecting life’s light in a different, unique hue. But this is not the remarkable experience I had been alluding to before. I’ll get there soon. Kathy grew up in Vancouver and lived on Vancouver Island for a couple of decades, too. She has had many experiences in her days and has lived a very interesting life, having traveled and explored, having had two children and now two loving granddaughters. Spending time with her grandchildren brings her back to the child inside of her. “I learn so much from her”, she said fondly of her eight year old granddaughter. Living a full and rich life can sometimes take its toll. Kathy has suffered a tremendous amount of back pain in her life. Having worked at a desk job previously never helped. When the pain persisted, she sold her car and started taking the bus more. And she discovered a wealth of beauty and knowledge and life in the conversations she would have with strangers on buses. When she eventually bought a new car, she noticed that this part of her life was missing. There were fewer moments of spontaneous connection with strangers. To overcome her back pain, Kathy tried a variety of different things. 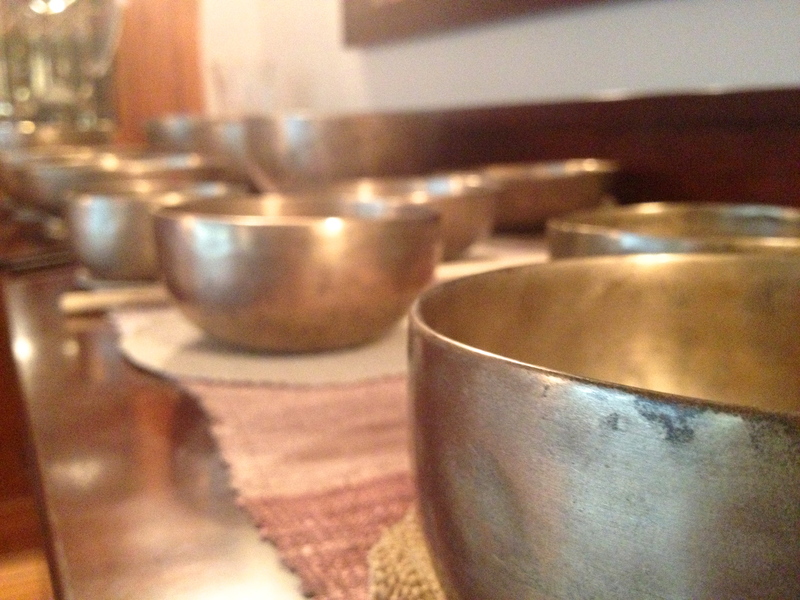 Meditation is something that was recommended to her, which she tried, accompanied by soothing, symphonic soundtracks. Kathy was quick to notice the sound of Tibetan singing bowls in the background and found it to be relaxing for her pain. She began to explore the art and science of healing through sound and vibration and she found it quickly calling to her towards it. 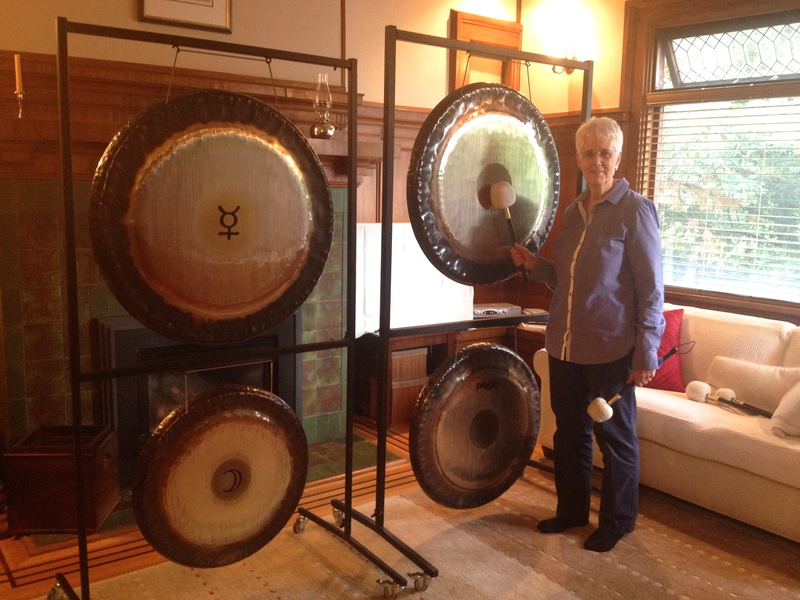 Kathy has been a sound practitioner since then, having started The Soul of Sound — helping heal and relax people from your average stressed desk-job worker to cancer patients to those suffering with rheumatoid arthritis to those who just want to feel moved by sound. The effects are soothing, relaxing, and calming. In her free time, she loves being in nature and going on walks. She’s recently discovered a new passion for photography, which has, as she so eloquently described, given her a new perspective in the way she notices the intricacies of the beauty surrounding her. She loves poetry, too. Her favourite word is “transformation.” Beautiful, isn’t it? I asked her about what it’s like to live alone, and to have spent much of her time alone. She told me that she’s the kind of person who needs a lot of time alone — it’s what energizes her. “I’m content”, she said, smiling. I brought up how interesting it is that those who enjoy alone time feel a need to add such disclaimers as their contentedness, as though offering reassurance to those suddenly burdened by their alleged absurdity. We agreed that it was interesting, and that there is a very important distinction to be made between being alone and being lonely. I myself have had similar experiences, which is perhaps why I was especially curious. Spending the last couple of months living alone and mostly working alone has been a fascinating endeavour, introspectively and perhaps less intuitively in an outward form, too. It was pleasant connecting with someone over this commonality. Now, to the remarkable experience unlike anything I’d ever felt before. 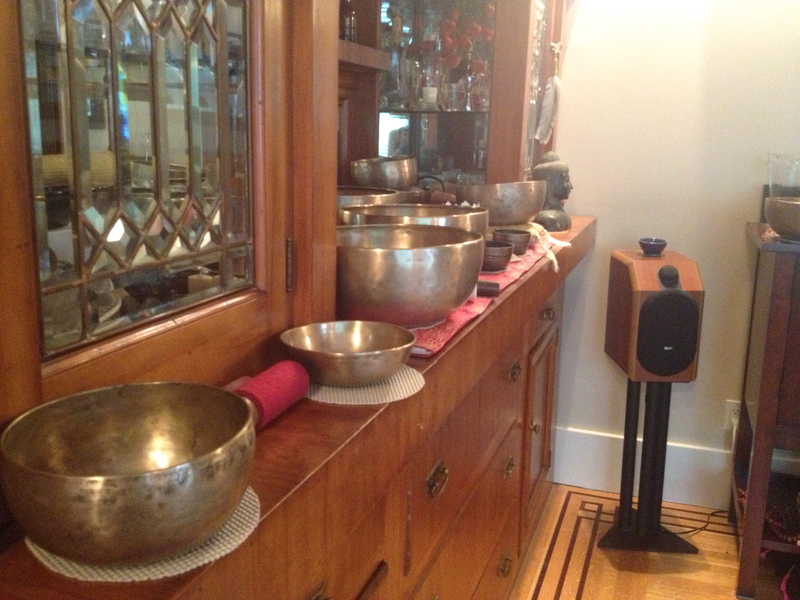 Kathy and I walked over to the living room, where she lay down a mat for me to relax while she played the gongs. Kathy had described the effects of the vibrations through sound to be a “massage on a cellular level”. I was curious and intrigued, if not a little bit skeptical of how I would feel. As I lay down, I listened to the sounds — though, “listened” is not quite the right word. It was more like a feeling. Like my eardrums were fingers on velvet. Like I had ears on every part of me, hearing the sounds through my toes and my elbows and my shoulders somehow. But I was still very much in my head. I was thinking, “I wonder if my bike’s okay”, as I had left it outside her home unlocked. I was thinking, “I wonder if the realtor accepted our housing offer”, and of how badly a part of me wanted to check my phone to find out. I was thinking about what I was going to do for the rest of the day, of how I had to prepare for a speech that evening. I was thinking about how I wished I’d stop thinking so much. And then I stopped thinking altogether. I was fully immersed and enveloped by the sounds and vibrations and I only remember coming back into alertness, not confused or startled but in absolute awe of how I’d for the first time separated my thoughts from my mind. I felt refreshed. I am so grateful to Kathy for having shared this experience with me. In total, we spent over three hours together, chatting and learning from one another. 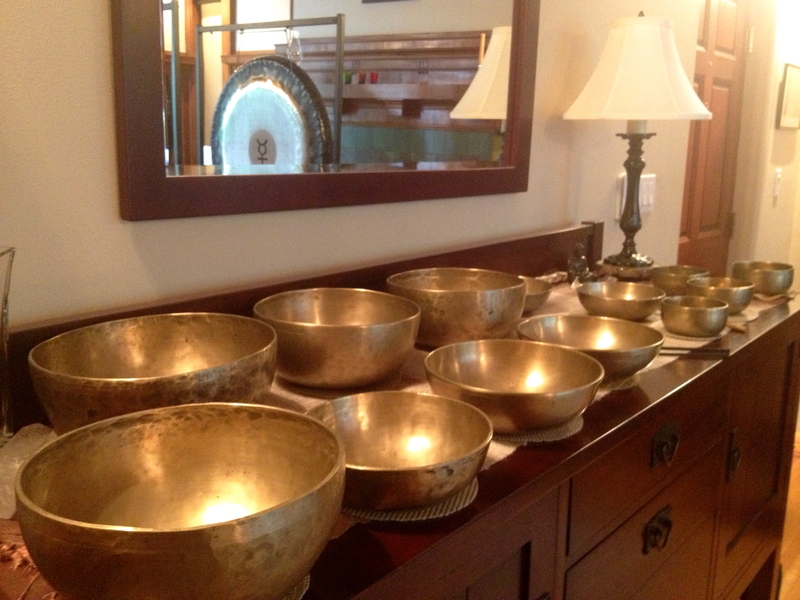 She has a full collection of instruments from around the world, from the singing bowls and the gongs, to a shruti box, to various drums, and I felt kind of like how she described it to be… “like a kid in a candy store.” There’s something about instruments and sounds that I’ve always found very grounding and inspiring, and it was an honour to spend my afternoon with someone who dedicates her life toward the sounds and the healing effects of them in honour of others. We hugged goodbye, and for the rest of the day I felt a deep sense of heightened clarity and openness to the world around me. Kathy had told me about a ritual she practices, whereby each night she thinks of three things she’s grateful for. Today, this experience with Kathy is number one on my list.